The three largest distributors of prescription opioids in Washington State are being sued by Attorney General Bob Ferguson for fueling the state’s opioid epidemic. Detailed in Ferguson’s King County lawsuit are the billions of dollars made from these suspicious shipments of over 2 billion pills of unregulated oxycodone, fentanyl, hydrocodone and other opioids. “Prescriptions and sales of opioids in Washington skyrocketed more than 500 percent between 1997 and 2011. 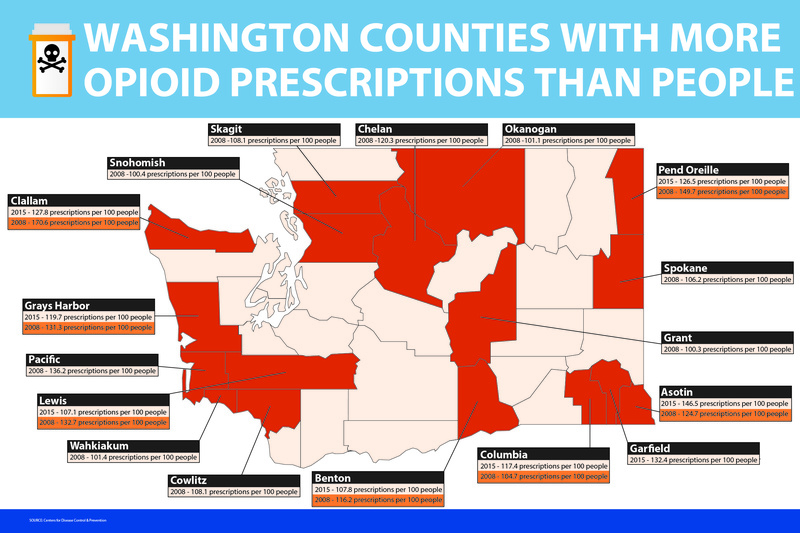 In 2011, at the peak of overall sales in Washington, more than 112 million daily doses of all prescription opioids were dispensed in the state — enough for a 16-day supply for every woman, man and child in Washington,” according to the AG’s announcement. In September of 2017, Ferguson sued one of the nation’s largest opioid manufacturers, Purdue Pharma, accusing the OxyContin maker of “fueling the state’s opioid epidemic by embarking on a massive deceptive marketing campaign and convincing doctors and the public that their drugs are effective for treating chronic pain and have a low risk of addiction, contrary to overwhelming evidence.” In April 2018 a King County judge denied Purdue’s attempt to dismiss Ferguson’s lawsuit. State medical boards have since implemented opioid prescription limits. Read the Washington State Attorney General’s Press Release here.